Get a beautiful, natural looking tan in as little as 2 hours with Eco Tan Certified Organic spray tan. Eco Tan’s award winning Organic formula is Australia’s first certified Organic, non-toxic, vegan, cruelty free tanning range. The colour comes from Cacao which creates a natural, glowing tan. Eco Tan leaves no nasty smells and doesn’t stain your sheets or clothes. For best results, it is recommended you wait at least 2 hours (Two Solution) and at least 4 hours for the Rich Honey Solution before showering, to allow your tan to develop. You can wait up to 8 hours or more before showering for best results. Your tan will continue to develop over the next 24-48 hours as it activates. A super hydrating formulation that has been specifically crated for dry, sensitive skin. Perfect for a ‘lunch time tan’ and has been specifically created for normal to oily skin tones. Your tan should last between 7-10 days depending on how you look after it. We recommend moisturising daily to prolong your tan and the use of Eco Tan Winter Skin is recommended to both moisturise and enhance your tan for longer. Why Is Using Eco Tan Spray Tan Safer Than Other Brands ? 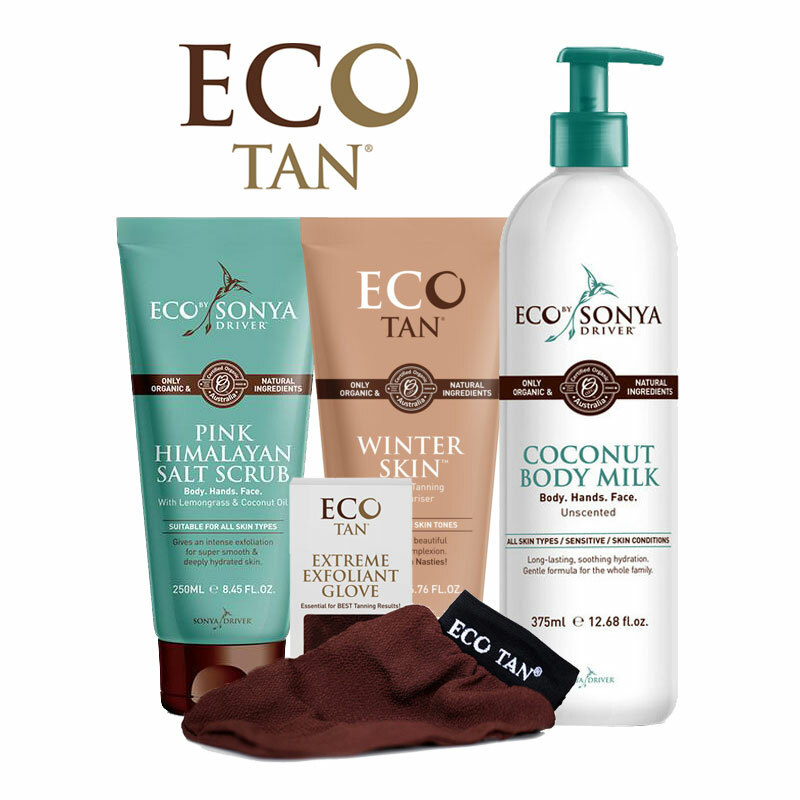 Eco Tan’s product formulas do not include in any toxins, GMOs or synthetic dyes. Instead, they are made from 100% natural ingredients including Cacao, Aloe Vera and Caramel. All Eco Tan tanning products are completely vegan to offer you natural beauty that is Certified Cruelty Free. Will Eco Tan Stain My Clothes or Bed If I Don’t shower First? It may but any stains will wash out in the washing machine. We always recommend consulting a GP/health care professional when pregnant as everyone and every pregnancy journey is different, even with Certified Organic products. The Eco Tan tanning range is made with only organic and natural ingredients Certified by the OFC, accredited Toxic Free by Safe Cosmetics Australia and loved by many expectant and new mums. We recommend a 24 hour patch test before application.